Hello from leaders Sarah and Jonathan! After a restful night, we emerged from our hotel and headed to Dilli Haat market for some final souvenir shopping. Dilli Haat market is a cultural market which subsidizes spaces for vendors from each region of India to sell their unique crafts, clothing, and food. (Families and friends: we’ll let the students share the gifts and details of their experiences here when you see them in a few days.) After the market, we ate lunch at a delicious South Indian restaurant (think dosas, uttapams, and coconut rice), then braved an intense but brief afternoon monsoon and made our way across town for a meeting with William Bissell, the general manager of Fabindia, one of the largest apparel companies in India. William is an old friend of Evie and Jeff Shumlin, and he graciously gave us an hour of his day to discuss his life and business ethos — we’d describe it as a college seminar with a good-humored, engaging, and truly inspiring business school professor. William led us through a pilot program that he and his colleagues tested: they sold shares of his business to the producers and store employees in order to test the effects of a ‘bottom-up’ model of capitalism. With a few quickly sketched graphs and diagrams, William gave students an idea of how a business can function without sacrificing any part of its ‘triple bottom line – social responsibility, environmental stewardship, and profit’ (his words). In fact, the model has been used as a case study at the Harvard Business School. 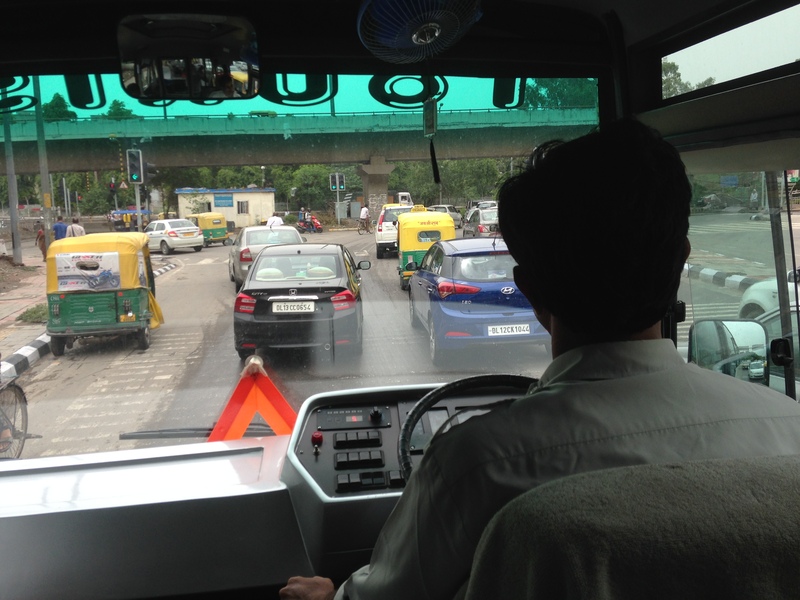 As a final gesture of kindness, he arranged for us to be shuttled to the Delhi metro (by far the quickest way to travel during rush-hour) on our way to our next engagement. What was that next engagement, you ask? Obviously, one’s first time in India would not be complete without a Bollywood movie in all it’s epic glory! We spent the evening reclined (yes, reclined) in the seats of a luxury theater, eating popcorn and watching the summer’s record breaking blockbuster ‘Bajrangi Bhaijaan” — check out the trailer here! Now we’re on our way to Agra for the final step of our long goodbye to India. Tomorrow we will watch the sunrise from the Taj Mahal and visit Fatehpur Sikri before heading homeward via Delhi airport. Until then! Sunday morning, we decamped from SECMOL with heavy hearts and many wonderful memories of our time in Ladakh. We were escorted to the airport by three of our closest friends, Stenzin, Chuskit, and Nikki, who wished us well as the sun rose over the mountains. Then we flew to Delhi, where we were greeted by our guide Rajendra, who helped us navigate the chaos and humidity of the city, which was a bit of a shock coming from the desert stillness of Ladakh. After a cafe lunch in the National Crafts Museum, we set out to see a bit of the city. We began with a stroll around India Gate (picture a more architecturally austere Arc de Triomphe), a monument to those Indian citizens who lost their lives in the two world wars and various conflicts and wars since. A breeze kept us relatively comfortable, and we enjoyed the park-like atmosphere full of families and couples out for the afternoon in the city. Later we met Rohit Sharma, a young Indian PhD student of spirituality and sustainability studies at Delhi University, who spent the next three hours giving us a very detailed tour of Humayun’s tomb (a palatial family burial monument from the city’s greatest Mughal ruler, who also commissioned the Taj Mahal for his deceased wife) and a tour of Old Delhi by bicycle rickshaw. As our drivers navigated the crowded streets, we took in the Red Fort (former Mughal fortified residences), the Jama Masjid (the largest mosque in India – spectacular! ), and the neighborhood’s sprawling markets, both formal and informal. Rohit led us through a Hindu temple, where gurus sat cross-legged in alcoves adorned as shrines to honor a handful of the hundreds of Hindu gods and goddesses, offering blessings and chanting prayers for the crowds of devotees. The atmosphere was much different than that of any Buddhist temples (called ‘gompas’) that we visited in Ladakh. This temple was more frenetic and intense, though not any more or less spiritual, and the level of interaction between people made it feel alive and accessible, even for foreigners. From there, we made our way through rambling side streets to Karim’s, a hole in the wall restaurant famous for kebabs, kati rolls, and other halal delights. Later, we returned to our hotel exhausted yet happy, ready for a good night’s rest and our second day in the city. Tara G: I focused on methods of sustainability I observed both in SECMOL and in the villages we visited on our hike, with a particular focus on green architecture. I picked this topic because I believe that sustainability and tradition go hand-in-hand in Ladakh, which is significant in a rapidly changing material world. I presented my topic as a mini-book with separate sections on each form of architecture and design. 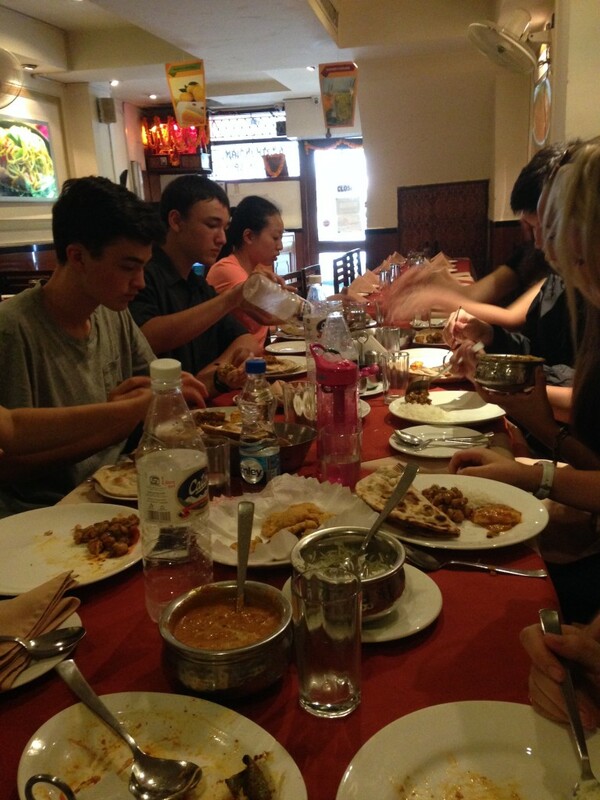 Amey H: I studied the culture of mealtime. While in my homestay, I was amazed with how involved the family was with the process of “farm to table.” I wanted a chance to compare that model to the typical American family and see the differences. I was very surprised by the issues of public health and gender that surfaced! 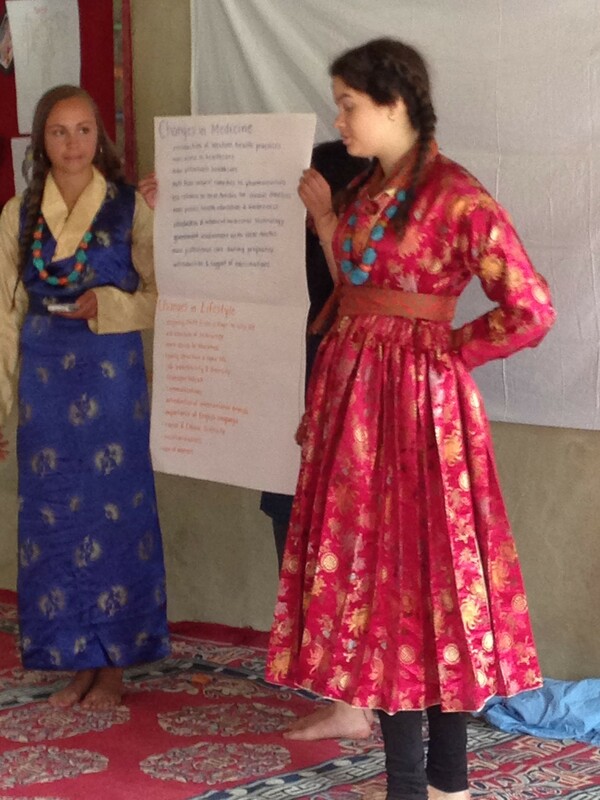 Catherine M: I did my project on the fundamentals of Buddhism, comparing how it is practiced in Ladakh vs. India. 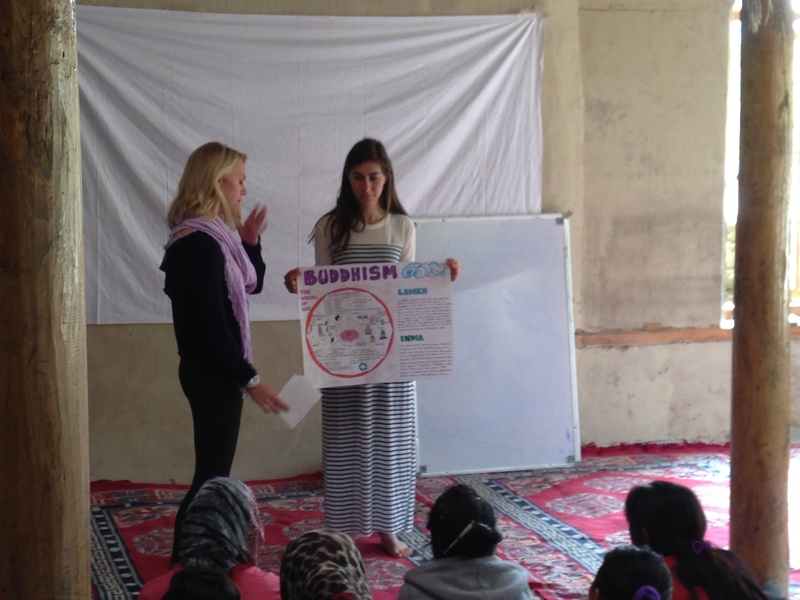 I presented a poster with an updated “wheel of life,” which showed the basics of Buddhism in a more relatable way, and then on the side, I compared Ladakh and other Buddhist regions in India. The project offered a great way to take something concrete away from the trip. I got most of my information from monasteries that we visited throughout the month. 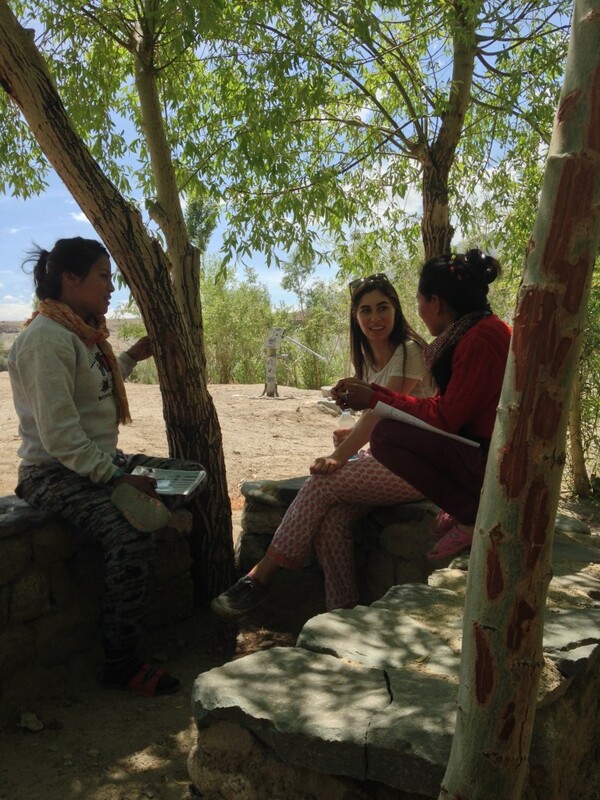 Magdalena R: The project that Maddie and I did focused on the generational changes in the Ladakhi population and the impact of tourists/foreigners since 1974 (the year in which the region became “open” to foreign visitors). We tried to expose the negative, positive, and controversial issues that are currently relevant here. 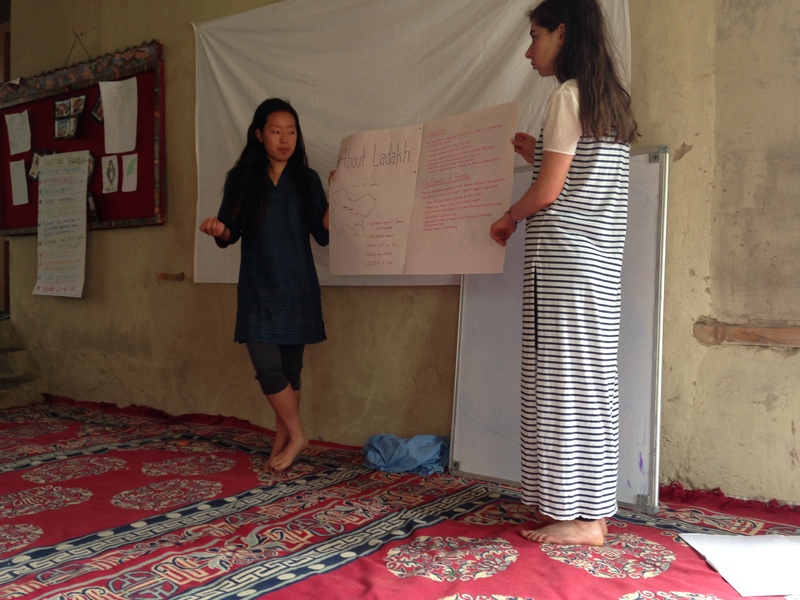 Maddie H: I focused on the re-opening of Ladakh to the outside world. I used information from the novel, Ancient Futures, as well as conducted primary research from interviews and through participation in meetings with NGOs. Magda and I highlighted medical, environmental, cultural, and lifestyle changes, and we discussed positive and negative effects — and effects which may be both — and proposed solutions for the future. 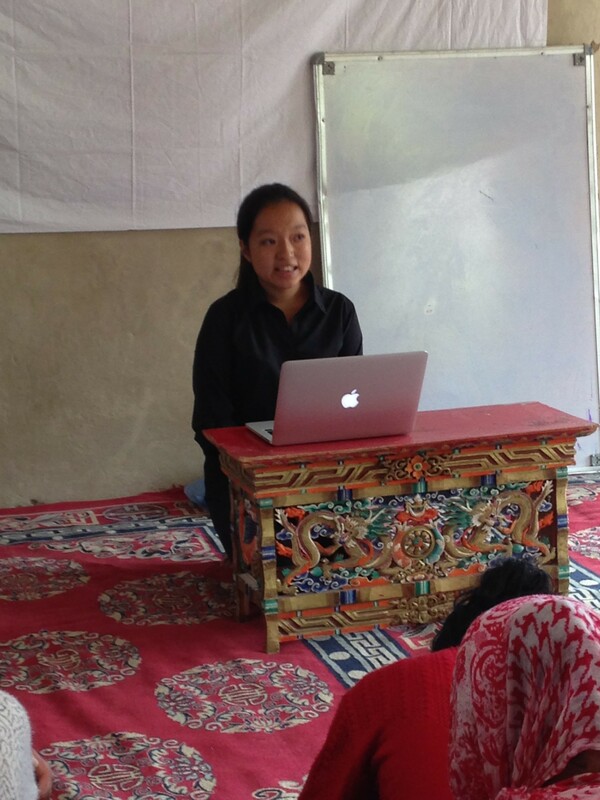 Téa L: My project explored how healthcare is delivered in Ladakh on a local (village-based) level. I also looked at the problems faced by the government in providing a national healthcare system and the potential structural issues in India’s healthcare system. Finally, I researched which epidemics and diseases have created the biggest public health issues in India. Sarah B: My project was most heavily based on interviews that I conducted with locals in villages and at SECMOL. I compared the conditions of people with physical and mentail disabilities living in Ladakh verses those in the United States. Tina L: My independent project focused on the relationship between China and Tibet. Having been raised in a very politically conservative environment, I found my interviews with all the Ladakhis and Tibetans living in Ladakh to be very eye-opening. I also learned a lot during the whole process. Hopefully I can explore a little bit more on this topic after I return home to Beijing. Ellis L: I chose to focus on the education systems in place in the United States and in India. I looked for ways in which the systems are similar and for differences that exist. I researched both public and private schools in the two countries. 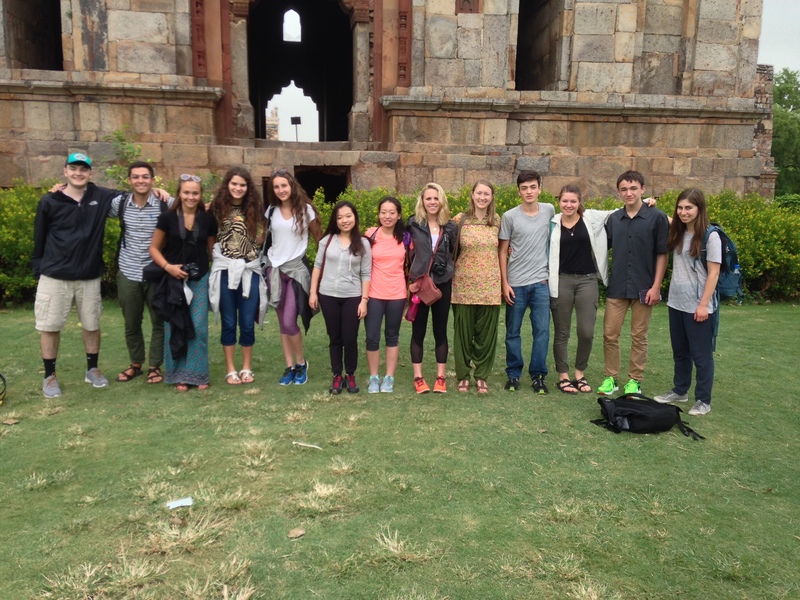 I learned a lot about the experiences of many Indian students and gained perspective on how my own education has been unique. While most students used a visual format to present their research, two students presented written work. That text is shown below. James B: My project focused on how Tibetan folklore and Buddhism related to each other. As my work progressed, I added a comparison between Buddhist and Christian origin stories as well. I told a creation story which, in my view, was like a Buddhist “Garden of Eden.” I then reflected on the morals from the story, the truths that were universal, and the lessons of each that were similar — they were all ideas that don’t need to be followed because they pertain to religion, but rather because all humans are affected by them. When humanity came into existence, we all had enlightenment. We were all gods. Infinite beings meditating in contentment. But one day, humanity began to eat the cream of the mountains. It was sweet and delicious. We stopped meditating and were no longer content. Slowly we lost the powers of gods and became human. Greed entered the world. Eventually, we ran out of the cream of the mountains and began to eat a fruit from a plant. This plant would regrow everyday and there was not enough food for everyone. But one man took more than his one fruit. And then there was never enough food. Starvation entered the world. People were forced to steal to eat. Dishonesty entered the world. The world began to overpopulate as women entered the world. The world was in total darkness. The sun, moon, and stars appeared as a last remnant of our good karma as gods. That was how the world was created. This story reminded me of the Biblical story of the garden of Eden. One bad action brought sin into this world. In Buddhism, evil begets evil. This idea can be seen in the story. One bad thought led to one bad action, which led to all bad in the world. Just as the eightfold path can save a person, so can it destroy us. What the story taught me was just how important right thoughts are. Even if I’m not a Buddhist and don’t necessarily believe in enlightenment, there are still many universal truths that this story teaches me. Negative thoughts lead to negative results, while positive thoughts lead to positive results. 1. How does this story compare to other creation stories? 2. Do you think the creation story is uplifting or saddening? 3. Do you believe that there are universal truths? 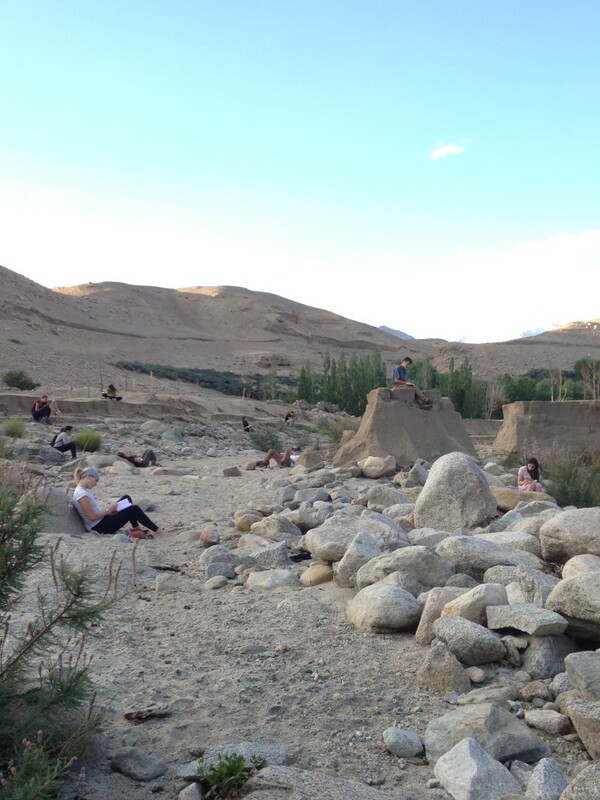 The following is an account of a snow leopard spotting near Ulley village, written by students James B. and Dzenan C.
Today we — a group of young Putney students and their leaders — spotted three majestic snow leopards, a rare sighting under the heat of the mid-July Ladakhi sun. Dzenan accounted: “It truly was captivating. 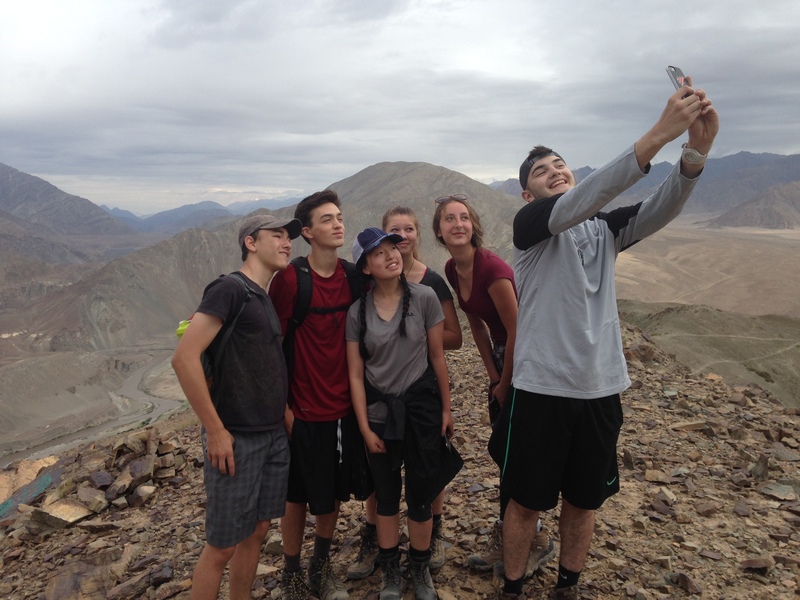 After hiking for hours, seeing a snow leopard was really invigorating.” James had an interesting perspective on seeing the “Shans,” as the Ladakhis would call them: “The ghosts of the mountains are elusive and rare. We were truly lucky to see them.” We’re not sure whether or not we’ll see the snow leopards again, but one thing is for sure: we certainly enjoyed the opportunity of joining the lucky few in seeing Ladakh’s apex predator. Greetings from leaders Jonathan and Sarah! Sunday we returned from our trek through the Sham Valley. 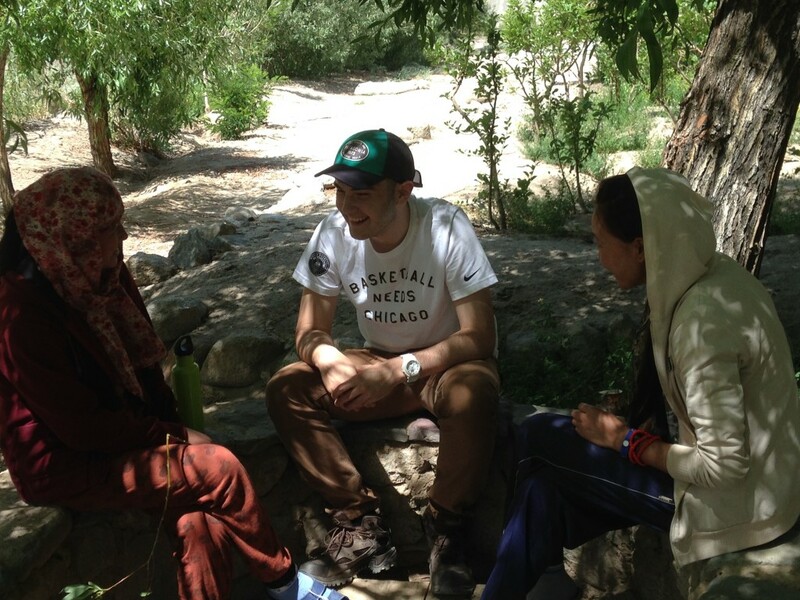 We visited five different villages over eight days, staying in beautiful and hospitable homestays along the way. Each day yielded different highlights – remote monasteries and nunneries, a 500-year-old ancient well (discovered just last year), snow leopards (! ), and the kind of sleep that only comes after a day spent hiking in the open air. 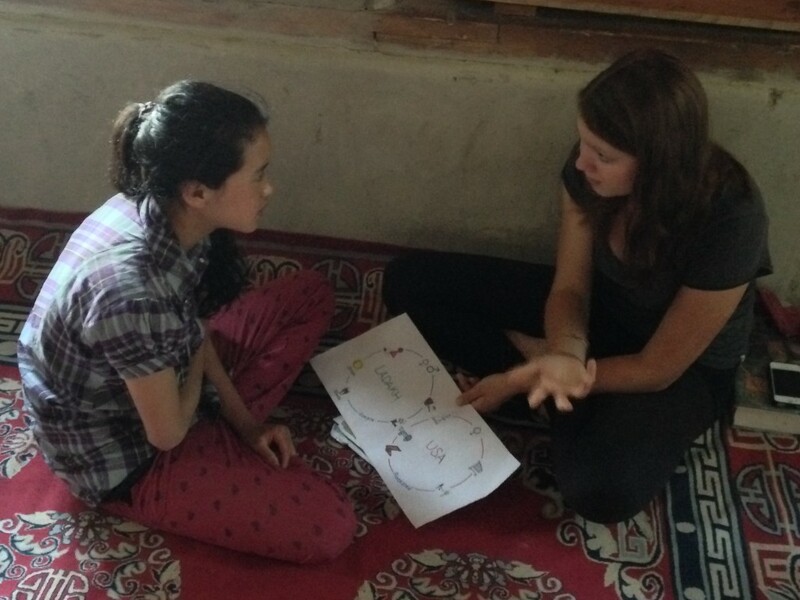 With our homestay families, we learned how to make momos, do laundry, and tend to cows, kitchen gardens, and barley fields. Most importantly, we learned the fine art of non-verbal communication — it can be a breakthrough to spend an evening playing games, sharing photos, entertaining young children, and sharing a meal without the benefit of a common language. 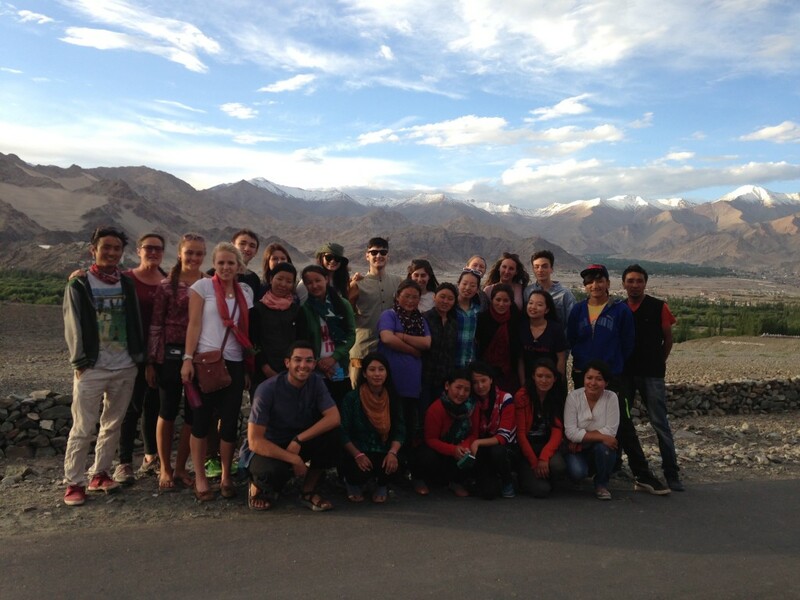 We are now settled back at SECMOL for a final week with our Ladakhi partners. Unseasonable rain throughout the region has disrupted nearly all internet connectivity in our area, so it’s likely that this will be our only update until we arrive in Delhi on July 26th. Once in Delhi, we hope to share many updates and photos of our adventures in Ladakh. Everyone is happy, healthy, and learning much, and we’re all excited for more adventures! Add ~½ cup of chopped cilantro. Remove from heat and stir. Serve with momos (or any dumpling). Actually, serve with anything. Good warm or cold! 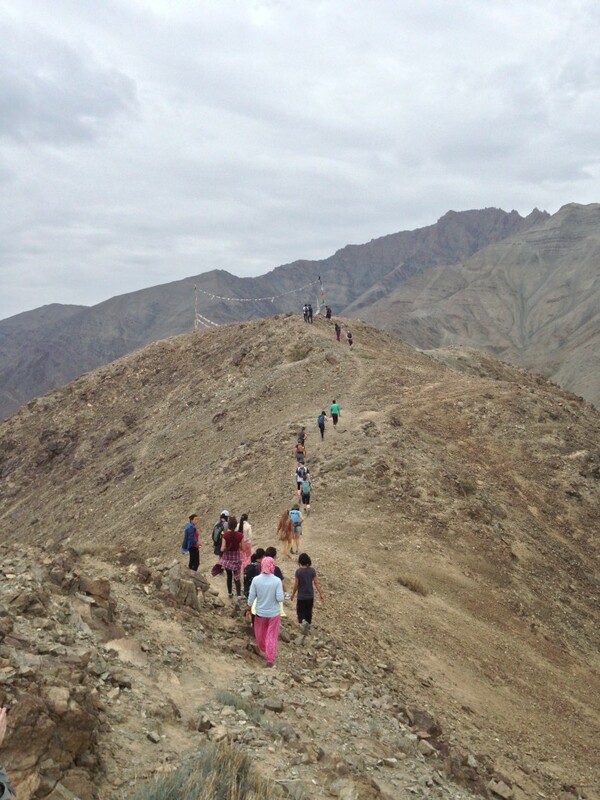 The group is currently on a guided trek and will be without internet access through July 20th. They hope to have a new update about their adventures soon! Early Friday morning, the students donned their hiking boots to climb Mt SECMOL, one of many of the not-so-small mountains that surround the school campus. We left shortly after sunrise, with a group of Ladakhi students as our guides and climbing partners, and after one turn were out of sight of the school and all other signs of the built environment. Valleys became ridges and saddles between peaks, and after about 2 hours of steep ascent, the group reached the summit. We shared a breakfast of bananas, Nutella, chapati, and Kashmiri cherries under a banner of weathered prayer flags while taking in an incredible view of the Indus valley. Many photographs later, we all returned to SECMOL, tired but walking a little taller, having risen to a physical challenge and enjoyed such a fine reward. This post features student writing. The people of Ladakh are the happiest people I have encountered in my lifetime. Not the short lived bout of joy that accompanies a material acquisition, but a sense of pride, a confidence that exudes from their steadfast belief in their culture. They speak Ladakh, they keep Ladakh traditions, they practice their unique worship of Buddhism. They are also very inquisitive about the Western world. I observed this in the first couple days, and all of us befriended Ladakhi people when we visited the monastery in the mountains and when we did the scavenger hunt in Matho (pronounced ‘Masho’). On the bus ride to the monastery, each Putney student paired up with a SECMOL student and we spent the hour talking about everything from learning English to favorite foods. I sat next to Padma, who has such a pretty smile, and she pointed out trademark scenery of the Ladakh landscape. At the monastery, we visited Nelly, a French woman who was a physicist as well as an art historian commissioned by the monks to preserve traditional Ladakh Buddhist art. Nelly had spent the past 18 years studying and discovering precious works, and one of the pieces she showed us was the missing canons of the Buddhist Scripture, which dates back to the 5th century when monks traveled back from Tibet to learn about and obtain official documents of their religion. She also told us of an annual festival put on by the monks in which two chosen ones inhabit spirits that channel words of wisdom and advice to the region. One of the most important aspects of Nelly’s role in preserving ancient works of art is her ethical approach to making sure the culture is as intact as possible and not imposing her Western beliefs into the construction of the museum. This is also shown through her teaching of local women of her techniques so they too can preserve their culture. After taking a tour of the monastery and taking in the beautiful sculpture of Buddha surrounded by his disciples and protectors, we had some snacks on the steps. We tried mokmok and samosas with a chutney sauce. It was very good and I’m starting to really enjoy the food! My favorite part of the day has to be doing the scavenger hunt with the SECMOL students. We received a list of several items and we wandered around the town looking for them. We were invited into people’s houses, which is completely unheard of in America, and they offered us tea and biscuits, speaking volumes of Ladakh hospitality. 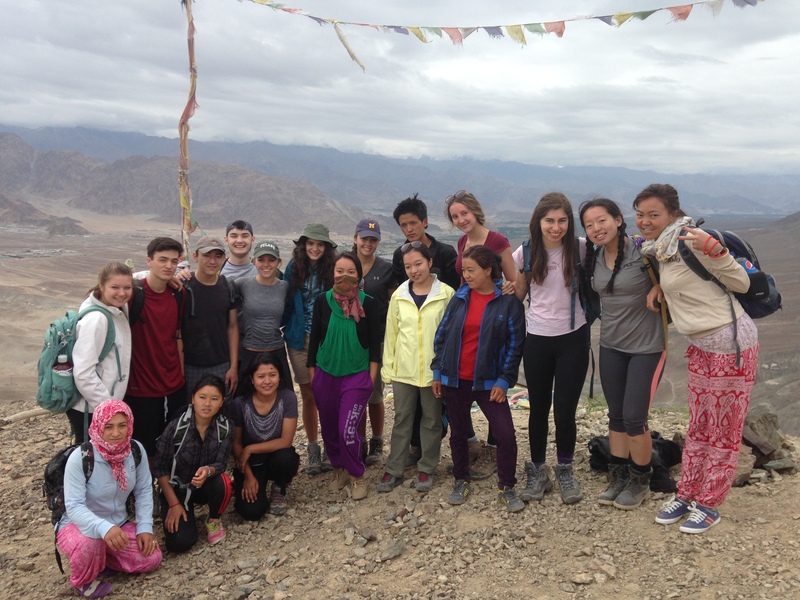 I think that even though we speak different languages and dress differently, friendship and understanding transcend these boundaries as both Ladakhi and Putney students are able to relate to each other and have a lot of fun while doing it. Today was our 2nd day in Ladakh. 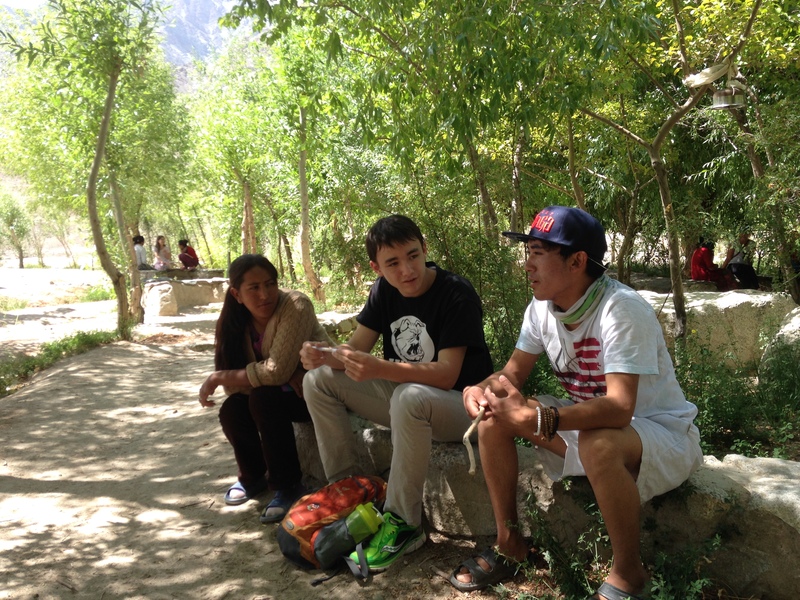 We started the day with rice and a cup of tea, then went to English conversation class, where we typically discuss various topics in partners with Ladakhi students. Today we discussed similarities and differences in our education systems. SECMOL is a school of kids who didn’t pass their 10th grade exams and need help completing high school, so it was really interesting to hear about the teaching style of Indian government schools, which focus on memorization of information, compared to SECMOL, which values critical and independent thinking. After lunch, our group walked to the nearby village of Phey. 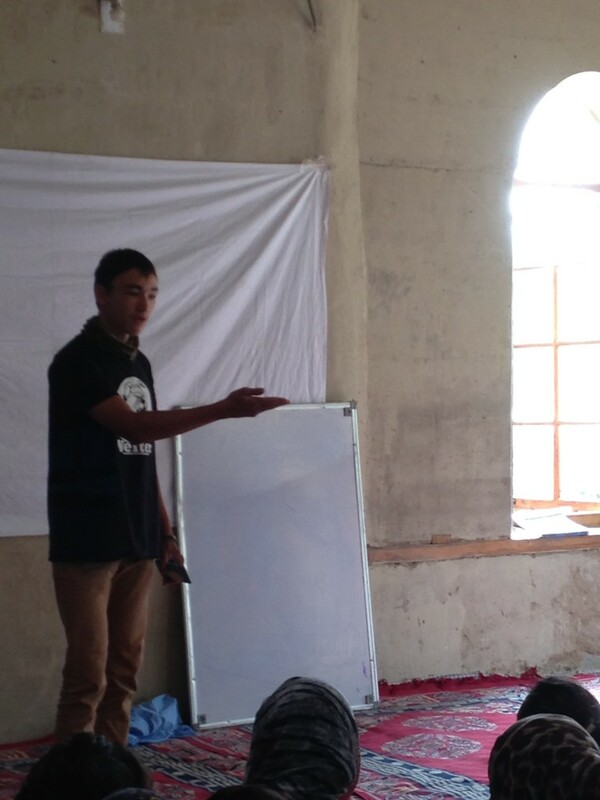 On the way, we stopped at a government school where we got to witness the teaching methods of a Ladakhi primary school. They shared several songs and dances with us. Later, we went to a house in the village for tea. We were generously offered tea and biscuits, and tried traditional butter tea for the first time (black tea, salt, butter, water). 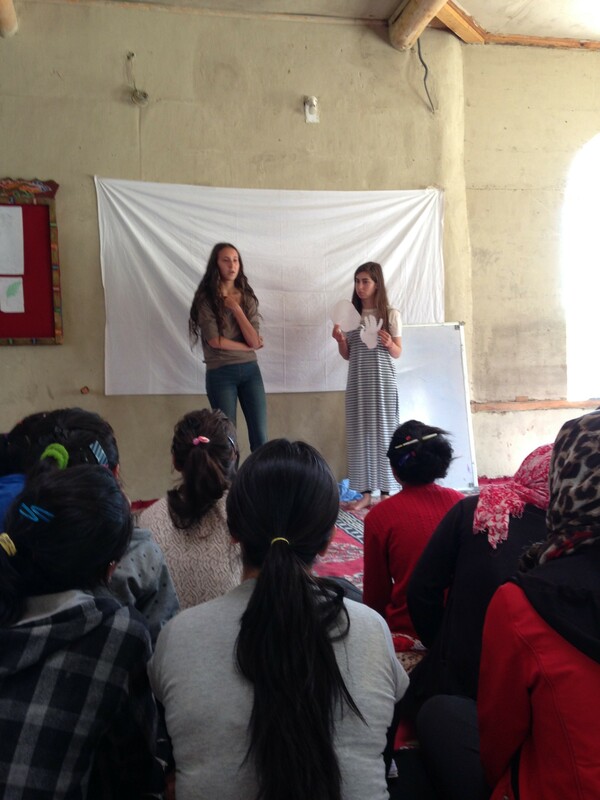 We thanked our hosts for opening their homes to us and continued to the monastery school up the hill. There we met the head monk who explained some of the basics of Buddhism like the karma, dharma, and enlightenment. 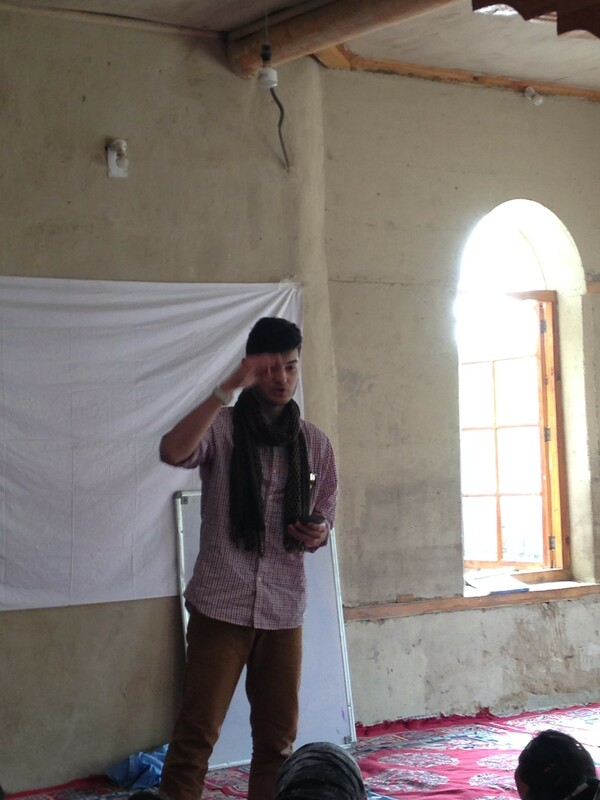 He explained the concepts so clearly and with very good examples and metaphors — it was captivating. After speaking with him, we had a short tour of the school before returning to SECMOL for dinner, dancing, and games with the students. All in all, an excellent day in Ladakh! Good evening from Delhi! After settling into the lovely Hotel Mantra Amaltas last night and enjoying a good night’s sleep in a real bed, we awoke bright, early, and excited for our first full day in Delhi. We were greeted with a rainy morning (the monsoon has arrived! ), which we spent getting better acquainted with all of our group members, as well as becoming oriented to our program goals and schedule. Afterwards, we set off to downtown Delhi for a lunch of delicious North Indian food at Sagar Ratna, and an opportunity to learn about and purchase some traditional Indian clothing at Fabindia (http://www.fabindia.com/company/). 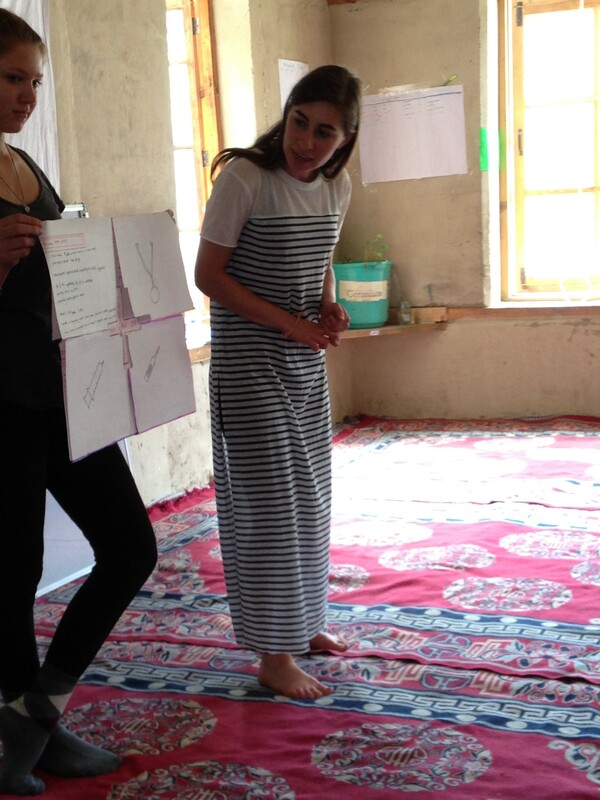 Everyone dove right in, trying on kurtas, colorful dupattas (scarves), pyjama pants – and a few intrepid young women even learned how to wrap a sari…not an easy task for your first day! 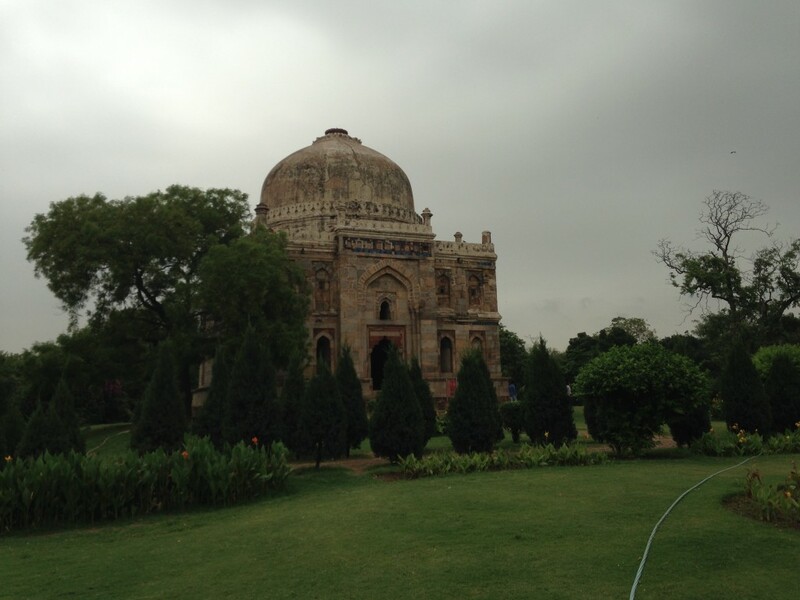 The rain stopped briefly and we headed over to Lodhi Gardens, a serene urban park and archaeological preserve, to stretch our legs a bit. 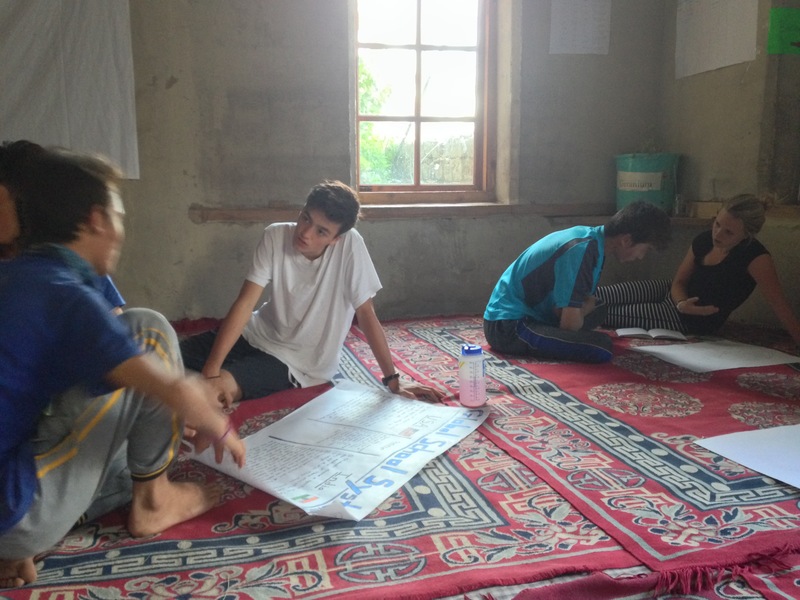 Students spent time in small groups exploring the grounds and the tomb of Mohammad Shah, using all of their senses to fully experience their new environs. We all enjoyed the opportunity to meet other young Indians and watch a vibrant cricket match between friends in such a beautiful setting. All that fresh air worked up our appetite, so we headed to the Big Chill cafe for ice cream on the way back to the hotel. Three words: Fresh. Mango. Smoothie. We’re now back at the hotel, where everyone is packing eagerly and setting our alarms for 2:45am for an early flight to Ladakh tomorrow morning. 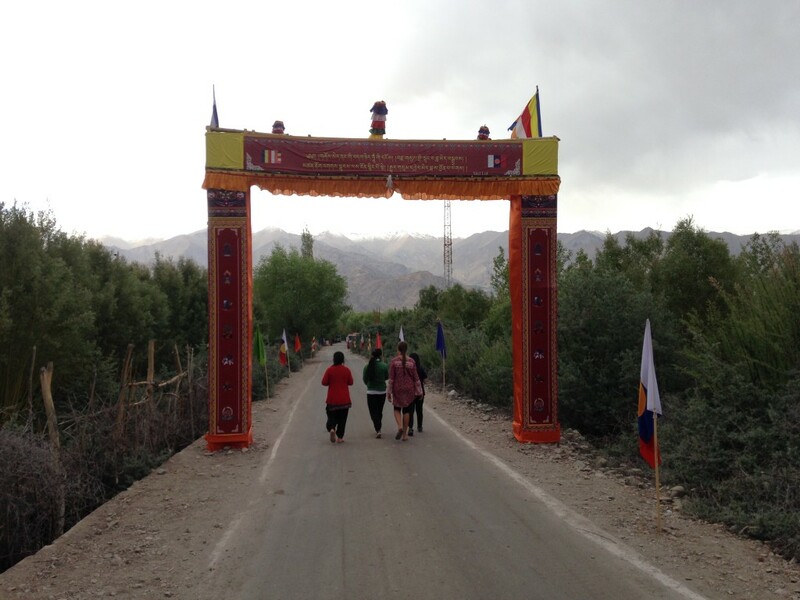 We can’t wait to arrive in Leh and meet all of the students at SECMOL (the Students’ Educational and Cultural Movement of Ladakh)! Keep in mind that there is no internet access at SECMOL, and communication from us will be a bit more sporadic. We will do our best to update you as much as possible.